This large, weather-resistant cargo bag holds up to 14.5 cu ft of gear. PVC tarpaulin material with covered zipper and welded seams keeps your gear clean and dry. 8 Tie-down straps let you secure bag in place. Fold flat for compact storage. 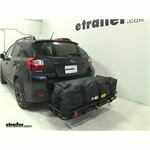 Call 800-298-8924 to order MaxxTow hitch cargo carrier bag part number MT80693 or order online at etrailer.com. Free expert support on all MaxxTow products. 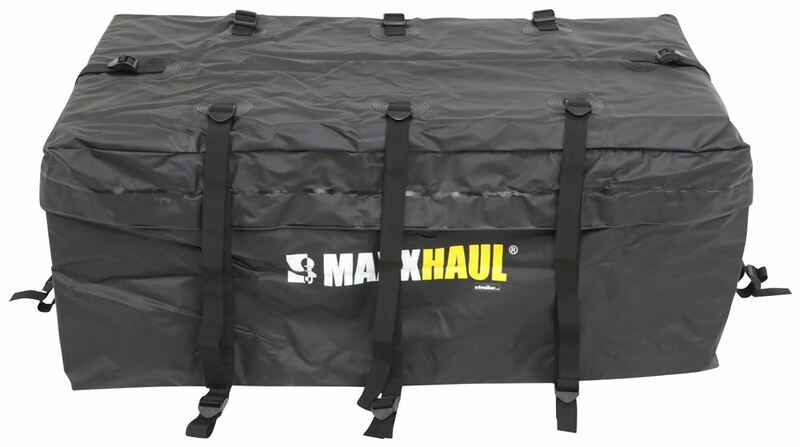 Guaranteed Lowest Price and Fastest Shipping for MaxxTow Cargo Bag w/ Mounting Straps - Weatherproof - 14.5 cu ft - 47" x 27" x 20". Hitch Cargo Carrier Bag reviews from real customers. 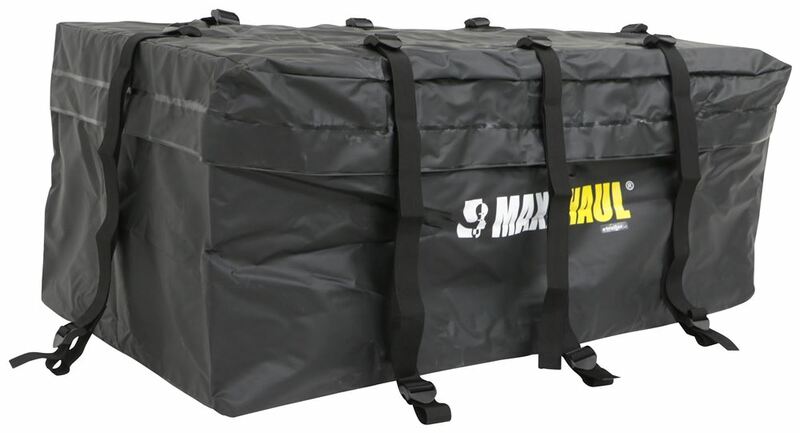 This large weatherproof cargo bag lets you transport up to 11 cu ft of gear on your hitch-mounted cargo carrier. It can hold luggage, skis, sports equipment, tents, sleeping bags, and more. The soft bottom of the bag conforms to your cargo carrier for a secure fit. You can also use this bag in your truck bed, in your trunk or rear cargo area, or on your roof-mounted cargo carrier. 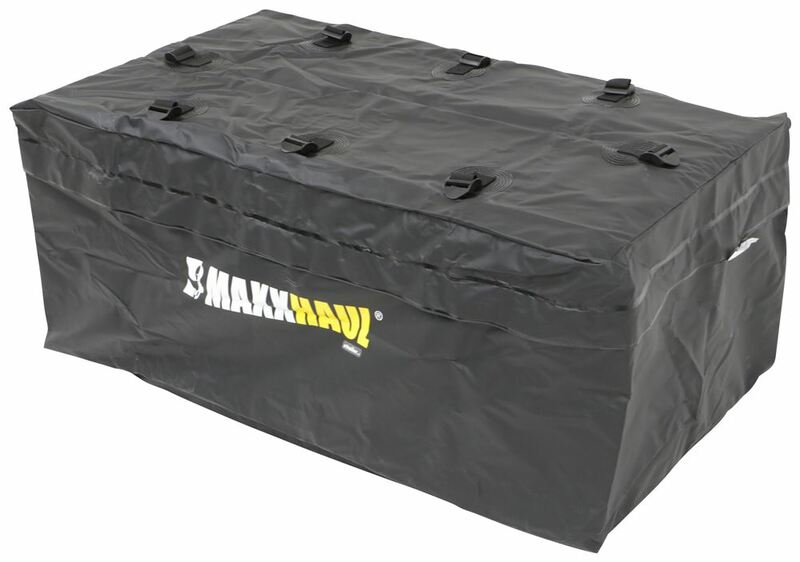 This cargo bag is constructed of heavy-duty PVC tarpaulin so it's hard to cut or tear. If it does acquire a hole or tear, the ripstop material is designed to prevent the hole or tear from expanding. The bag is also weather resistant so your cargo stays dry in rain and snow. And for added weather protection, the seams are fused together to create a watertight seal. A large, double-zippered opening on top of the bag makes it easy to load and unload your cargo. The zippers wrap around 3 sides so that you can fully open the top. 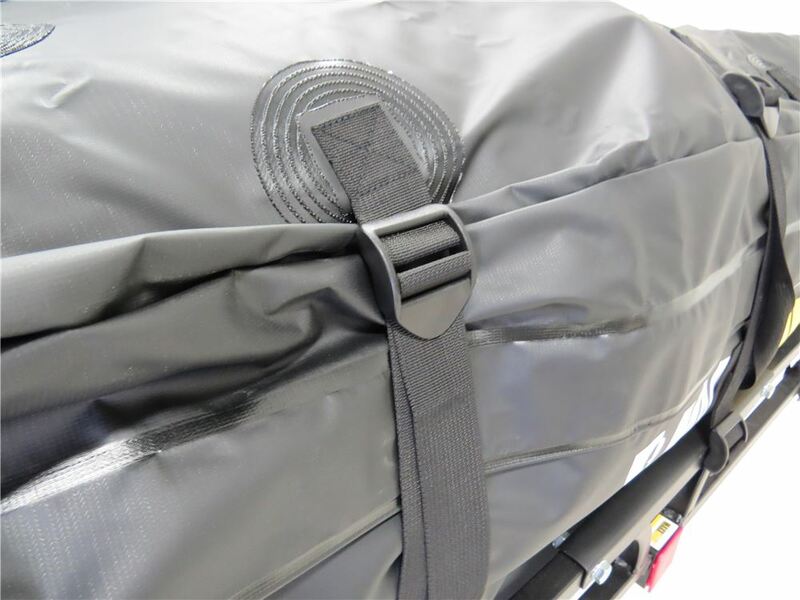 There is a flap with hook-and-loop fasteners that provides extra moisture protection for your cargo and helps protect the zippers from rust and corrosion. 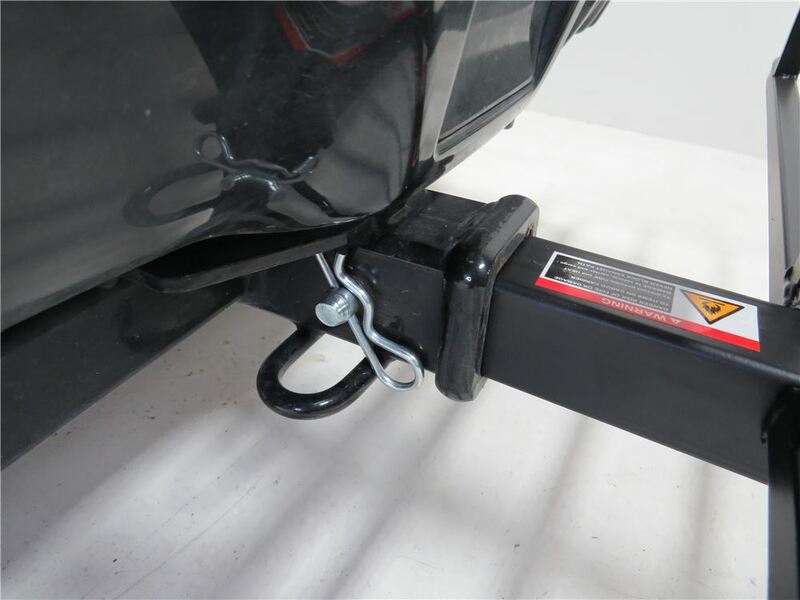 You can add a small padlock to the zippers to secure your cargo. 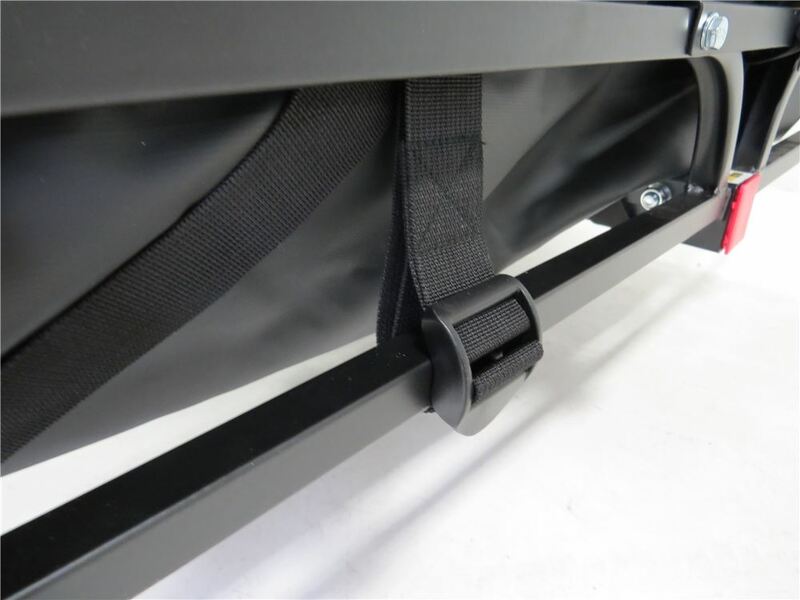 8 Tie-down straps secure the bag to your hitch-mounted carrier or roof rack. Each strap attaches to one of the 8 integrated buckle attachments on the bag. Simply feed the long end of the strap into the buckle attachment on the bag. Then loop the short end around the side rail of your cargo carrier and feed it into the buckle attachment on the strap. Pull the strap tight and then tie off the excess. 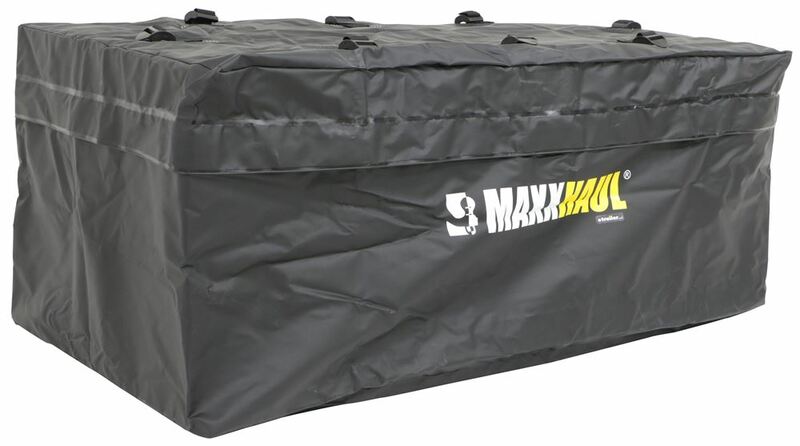 Video of MaxxTow Cargo Bag w/ Mounting Straps - Weatherproof - 14.5 cu ft - 47" x 27" x 20"
Speaker 1: Today we're taking a look at the MaxxHaul cargo bag with the included mounting straps. Now, this cargo bag holds 14.5 cubic feet of gear on your hitch-mounted cargo carrier. 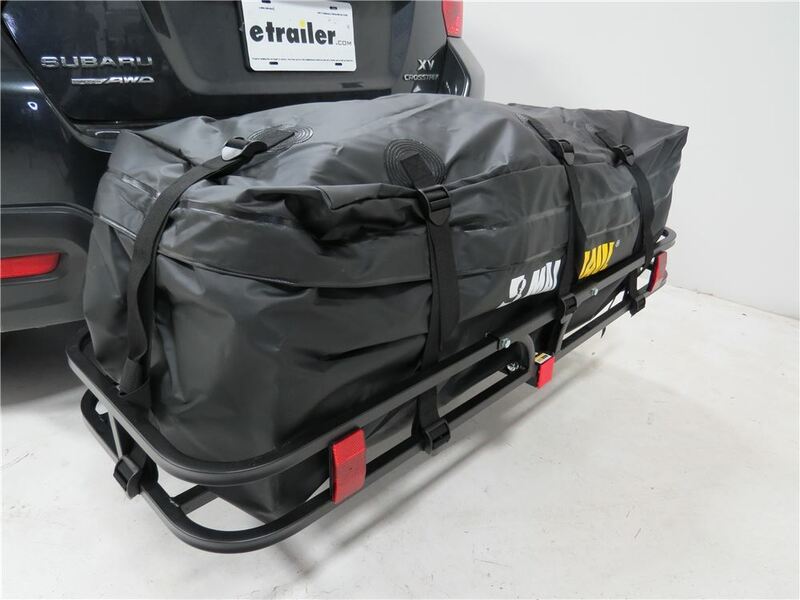 You can also use this to haul stuff in your truck bed, and your trunk, or on a rooftop-mounted cargo carrier.The bag features a nice soft bottom. 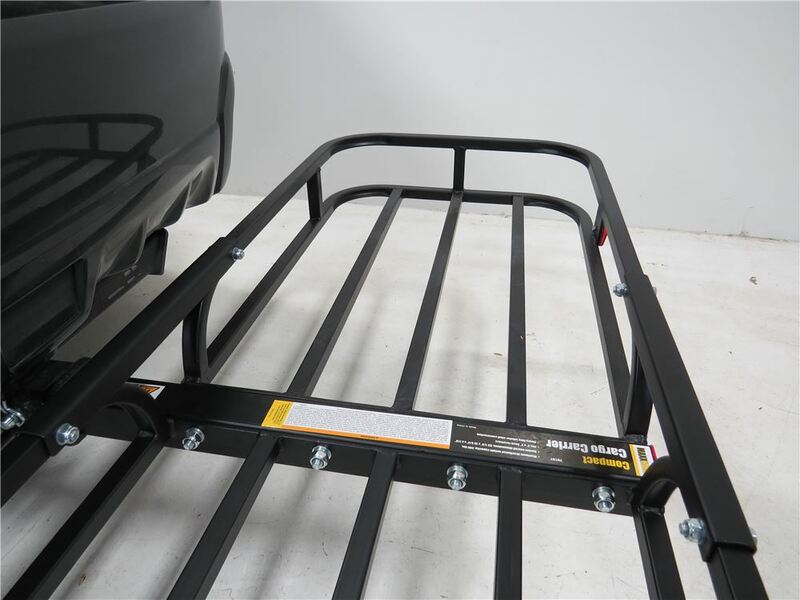 So it's designed to conform to your cargo carrier for a secure fit. This bag is great for luggage, sports equipment, camping gear, and other large items. So you can put your gear in this bag, freeing up some space inside your vehicle, and with it in this bag you don't have to worry about it being damaged or ruined by the rain or by the elements. It's a really nice, durable bag, and it's a safe, effective way to protect your gear to get it out of the vehicle, but still take it along with you.The unit is constructed of a weather resistant PVC material, with polyester reinforcement and UV coating. Again it's a very strong and durable construction. It protects all of your cargo from rain, sun, dirt, and road debris, and one of the neat things about the bag is that it features water-tight welded seams to block out moisture. So that's a really nice feature of this cargo bag. Also want to point out that it features heavy duty double zippers that wrap around three sides of the bag to provide quick and easy access to your gear. The zippers do have a large hole, that way you can bring the zippers together and you can even lock them with a padlock. The padlock's not included, so if you're interested in one you can find those at etrailer.com. They are sold separately.Another neat feature is that around the perimeter where it opens it's got this flap, and it's got hook and loop closures on it. So the hook and loop flap shield the zippers from the elements, and helps prevent leakages. Helps things stay out where they belong and not get inside the bag. As you can see it does have the tie-down straps. There's eight of them, three on the front, three on the back, one on each side. 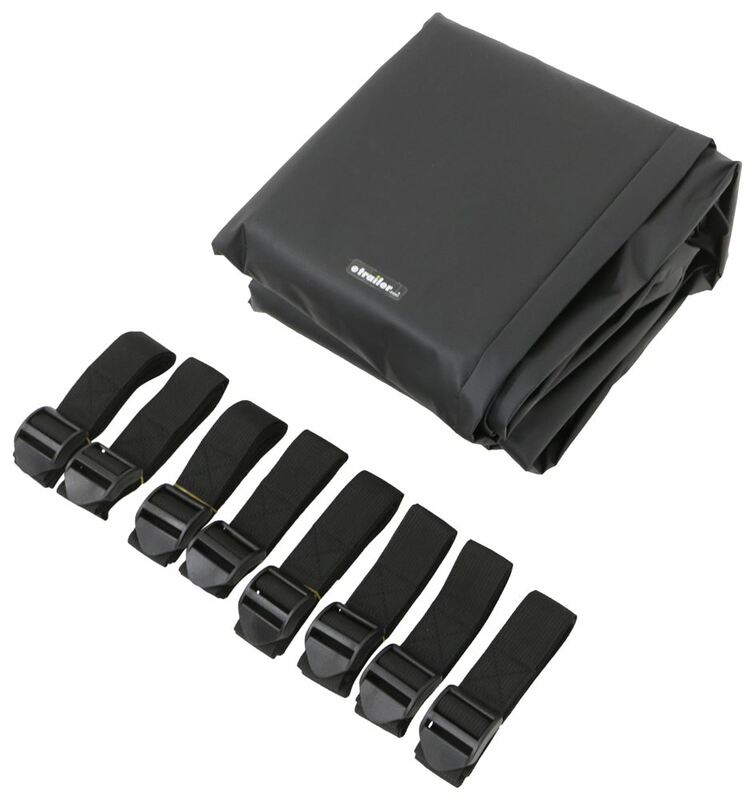 So a total of eight tie-down straps with buckles secure the bag to your cargo carrier. It's a really nice design. They're very secure here as you can see.I'll open it up. That way you can see how it is attached and how it doesn't affect the inside of the bag. But here where they're attached, again that's all welded seams, so you don't have to worry about those areas allowing any moisture inside the bag. It's a very well built unit, and it seems just fully sealed up, like it's not going to let anything in at all. Another neat feature about this bag is that it uses what's called rip-stop material. 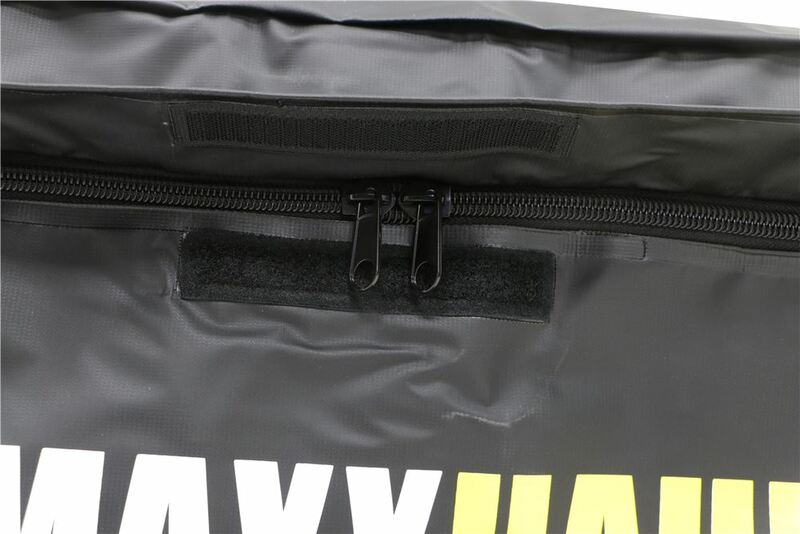 So if for any reason the bag was to get a puncture in it, or to get cut, or ripped, or a small hole, the material stops that hole, or stops that tear from spreading any further. So in the unfortunate scenario where it does get a rip or a tear or a hole you don't have to worry about it expanding and causing a larger issue.When the bag's not being used it can fold pretty flat for compact storage. Again storage capacity is 14.5 cubic feet. Just to give you an idea of how big the bag is, edge to edge, it's about 47" long. Front to back is about 27" wide, and then bottom to top is about 20" tall. 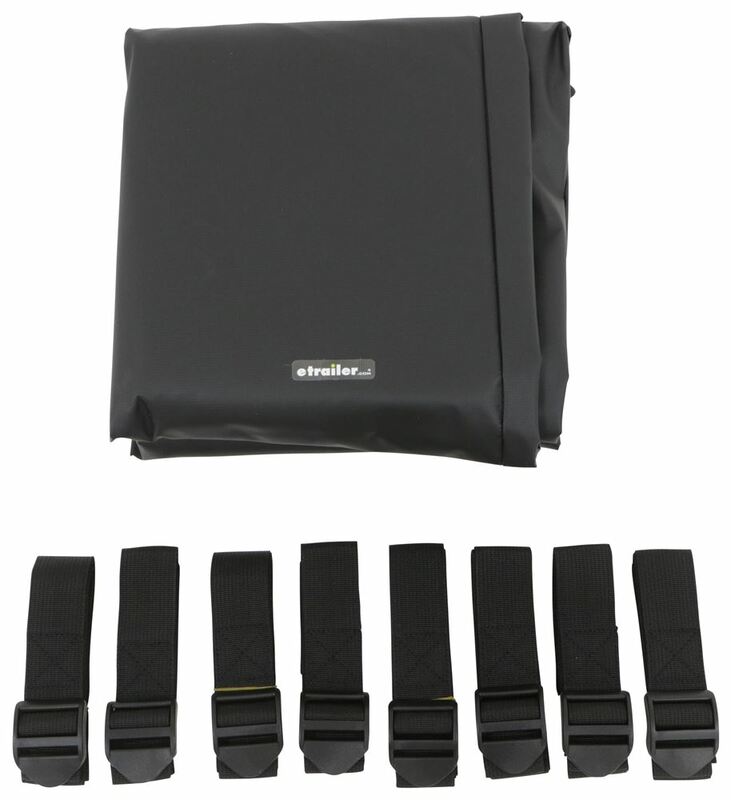 Each strap has a width of 1-1/2", and the weight capacity for this unit is 100 pounds. Now we do have it stuffed with some etrailer gear, that way it looks a little bit more filled so you can get a good look at how it would look once you have your gear loaded. So I'm going to open it up.What I like to do is take this flap and go ahead and open it up around the perimeter. It's got multiple hook and loop closures. Then we'll take the zipper, we'll go and open it. So you can see here how with it open you have plenty of room to get your gear in and out of the bag. We can go ahead and close it back up.Pretty easy to use. Doesn't feel like that zipper snags at all. It's got really nice, seamless operation to it. Once you have the zippers all the way zipped up you can place over that flap and make sure it secures with the hook and loop fasteners. That's all there is to it. 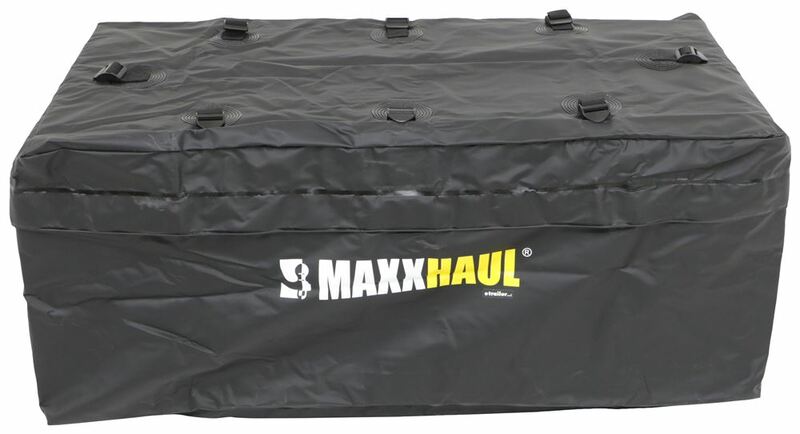 That's going to do it for today's look at the MaxxHaul cargo bag with the included mounting straps. Order: RelevanceNewestRating - High to LowRating - Low to High This large, weather-resistant cargo bag holds up to 14.5 cu ft of gear. PVC tarpaulin material with covered zipper and welded seams keeps your gear clean and dry. 8 Tie-down straps let you secure bag in place. Fold flat for compact storage. 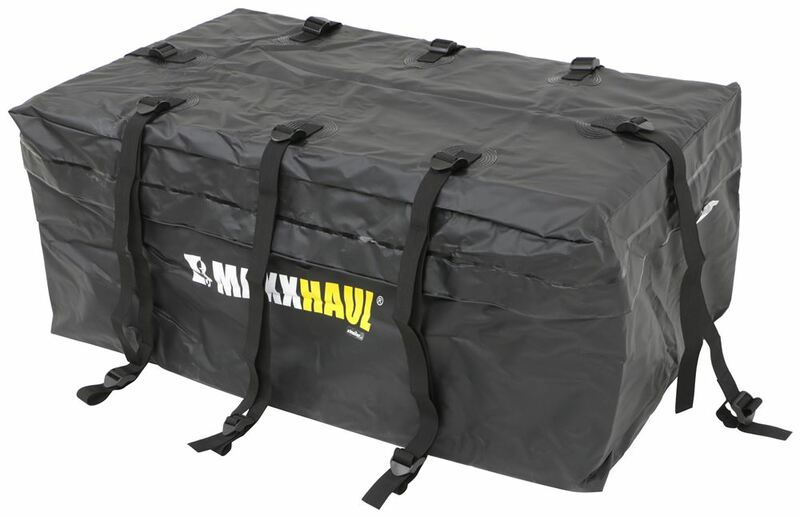 PVC cargo bags like the MaxxTow part # MT80693 that you referenced when really close to exhaust pipes normally would only melt if they got too hot. Catching on fire would not be likely at all unless maybe you had something flammable in the bag. 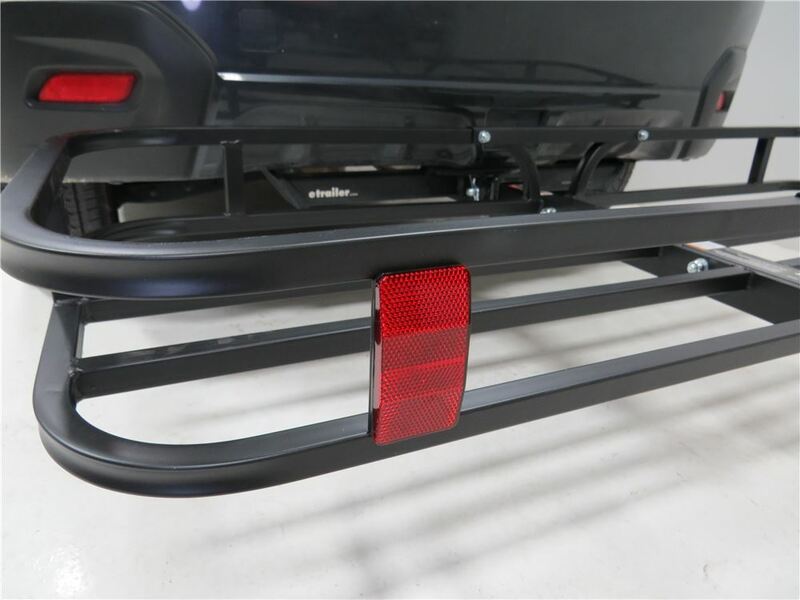 For situations like yours we normally recommend a carrier with a rise built into the shank to help get the platform above the exhaust pipes like the Reese part # 63153 which has a rise built into the shank of 2-1/2 inches.